At emergency meeting of Organization of Islamic Cooperation Erdogan vows to resist US recognition of Israeli sovereignty over Golan Heights. 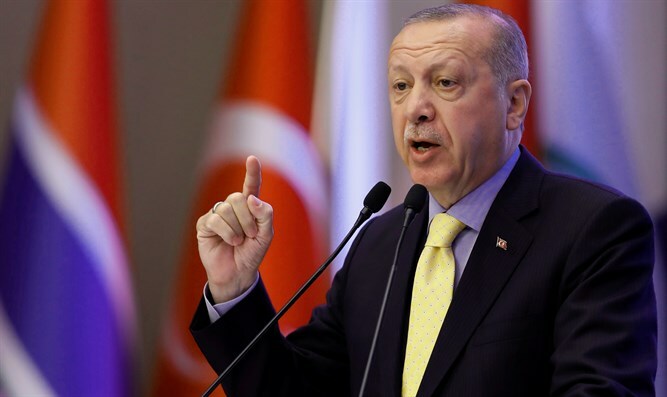 Turkish President Recep Tayyip Erdogan blasted President Donald Trump’s decision Thursday to recognize Israel’s annexation of the Golan Heights, warning Friday that the move would destabilize the Middle East and lead to “a new crisis” in the region. Speaking at an emergency meeting of the Organization of Islamic Cooperation Friday morning, Erdogan vowed to pushed back on efforts to ‘legitimize’ Israeli sovereignty over the Golan Heights, while claiming that US recognition of Israeli sovereignty over 500 square miles of the strategic plateau would lead to “more violence”. “The US president's unfortunate remarks on Golan Heights brought the region to the brink of new crisis, tension,” Erdogan added. The Turkish Foreign Minister, Mevlüt Çavuşoğlu, joined in the attack on Trump’s decision, tweeting late Thursday night that recognition of Israeli sovereignty over the Golan would lead to “new violence” and “pain”. President Trump said Thursday the US would be ending its policy of non-recognition of Israeli sovereignty over the Golan Heights, tweeting: "After 52 years it is time for the United States to fully recognize Israel’s Sovereignty over the Golan Heights, which is of critical strategic and security importance to the State of Israel and Regional Stability!" The president is expected to sign an executive order formalizing US recognition of Israeli sovereignty over the Golan next week. While Israeli ceded part of the Golan in a deal with Syria following the 1973 Yom Kippur War, roughly two-thirds of the 700 square mile Heights remained under Israeli military rule until 1981. In 1981, Israel passed the Golan Heights Law, applying Israeli law directly to the Golan and ending the military administration of the area, effectively annexing the territory. The US, UN, European Union, and virtually the entire international community have refused to recognize Israel’s annexation. Following Trump’s announcement Thursday, the US has become the first major power to recognize Israeli sovereignty over the Golan.